Blinq is having a Featured Sale that includes some audio-related products running until Saturday at 11:59pm eastern. The coupon is applied automatically in the cart, but in case of technical issues, you can also find the coupon at the aforelinked page. Here comes another Sony offer at Guitar Center. This time it is the new condition Sony Walkman NW-ZA17-SLV digital audio player going for $230 with free shipping or store pickup. Note that most sale items are not eligible for coupon code PRESDAY18 which is 15% off products priced $199 or higher. The discount is larger than the coupon percentage anyway. More action on the Massdrop front, the xDuoo Nano D3 digital audio player is unlocked for $75 with free shipping for the next four days and change. This will ship in early February 2018, with all sales final. There is no mention of warranty in the listing. This can play up to DSD 256, has a microSD slot (up to 256GB), a 2-inch IPS screen, 8GB on-board storage, and around 20 hours battery life. Another offer is now unlocked at members-only but free-to-join Massdrop. It is the new condition XDuoo X3 Digital Audio Player going for $85 with free USA shipping. The offer runs for the next four days and change from blog-posting time. Three color choices are available at checkout. It will ship in late January 2018 from Massdrop and all sales are final. 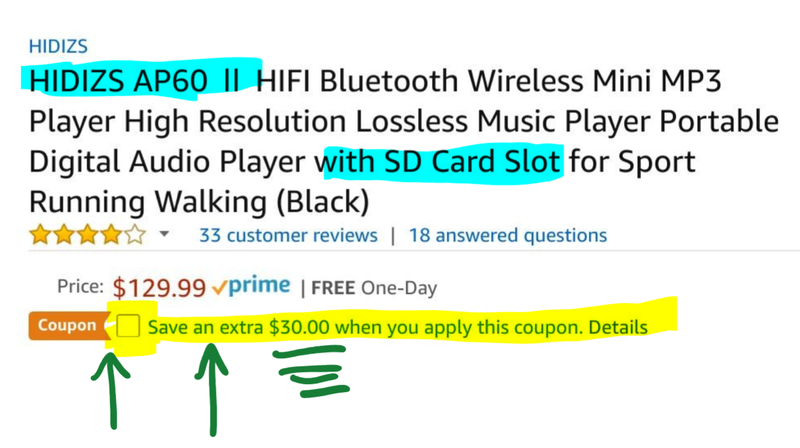 If you don’t want to wait for that long, $100 will get it you faster, there is a fulfilled by Amazon seller, so Prime members get it in around two days. The new condition Astell & Kern AK120 II DAP (it’s a lot more than a DAP, but if something plays music, I file it under DAP) is currently on sale for $730 with free shipping at B&H Photo and also by a marketplace seller with the orders fulfilled by Amazon. A trio of “fulfilled by Amazon” sellers are offering the new condition Astell&Kern AK100 II DAP for $479 with free shipping, including “ProStudio Sound & Music” which is currently the featured marketplace seller on this offer. There’s even a digital audio player (DAP) that’s participating in the Pay with Prime Credit Card promotion. If you are a Prime member paying for the order with one of the two official Prime credit card, you will receive 20% back as a statement credit. In this case, you pay $249 for the Hifiman HM700 DAP + RE-400 IEMs and after your monthly credit card statement closes, you will receive a $50~ statement credit. They have to be sold and shipped by Amazon proper. This is a limited time offer, expiration date unknown. The offer is running while you see it mentioned on the individual product pages. If you don’t see it mentioned, it means it expired!!! It’s Fiio time! The second generation Fiio X1 digital audio player is on sale for $85 with free shipping at Adorama and also at B&H Photo. I haven’t seen or used the second generation model, but we have here a text and pictures unboxing of the first generation X1 DAP which has settled on to $80 after the second generation model was released. The black/gold color-scheme of the new condition Cowon Plenue D (32GB + microSD) digital audio player is on sale for $189 with free shipping by Jet Audio fulfilled by Amazon, and also by B&H Photo who has 140+ handpicked Black/Cyber doorbusters. Good until 1:05pm ET, it’s Chi-Fi DAP time, the new condition AGPTEK A20BS 16GB MP3 Player with FM Radio/Voice Recorder and microSD slot is a lightning deal for the very specific price of $27.91 with free shipping in your choice of black, blue or white color schemes. This averages 3.8 out of 5 based on 160+ customer reviews and has nearly 100 answered questions, so there’s definitely some interest in it! This too is part of a very busy Gold BOX. Move over fancy DAPs! We are ready to kick out the jams now 😉 The new condition 8GB Sandisk Clip Sport is on sale, new condition, in many pastel-y colors, for $25 by Amazon actual. Limit up to three per color per customer. If you are feeling more sporty, the 8GB Clip Sport is on sale for $30 with free shipping for all with the same limit of three per color per customer. Also on sale is the Clip Sport Plus for $52 in new condition. All these sold by Amazon actual. If you want to get a seventh generation iPad Nano without breaking the bank, eBay seller VIP Outlet (Arkansas) is offering the seller refurbished 16GB iPod Nano (7th Generation), model MKN02LL/A, for $100 with free shipping. It comes with a 90-day warranty from them, and a 30-day return policy. Limit up to five per customer. Seller-refurbished is typically higher risk than manufacturer-refurbished which is typically factored in the prices. The 7th generation Nano is the first to use the new Lightning connector. It also has a headphone jack, and supports bluetooth 4.0. For more on the Nanos, dig into Wikipedia. More action in the Hifiman eBay store, the more expensive Portable Music Players were too embarrassed of the lower price of this model to have it under their DAP category so instead they pushed it to the “Other” category. Yes, the Otherization of DAPs! Okay, silliness aside, the new condition HifiMan Mega Mini Media Player is on sale for $99 with free shipping by the Hifiman official ebay store in your choice of silver or gold or gray color schemes. This can take microSD cards (often called “TF” in Asian tech specs) up to 256GB, and can play up to DSD. They have a long product description over there on the eBay listing, including a Q&A that answers the question whether it “requires a break-in”. I’m afraid to say that the only way to properly break in audio equipment is to use $999 audio cables, play alternative whale songs and pink noise, while wearing the headphones upside down and singing opera. This is known! If you are up early tomorrow, per the Gold Box lightning deals schedule at Amazon, they will have a lightning deal offer starting at 6:09am ET on the new condition Hidizs AP60 (2nd Generation) digital audio player. The price before the sale is $130. They play DSD, support bluetooth with apt-X, microSD slot up to 256GB, etc. They are available in five color schemes and average 3.6 out of 5 based on 18 customer reviews.